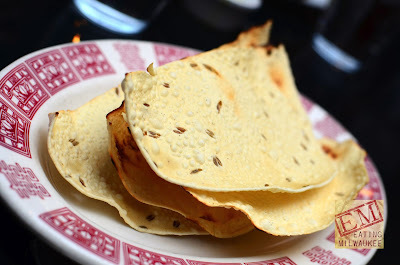 Anyone who knows anything about us, or has read the blog in the last three years knows that we here at Eating Milwaukee love Indian food. 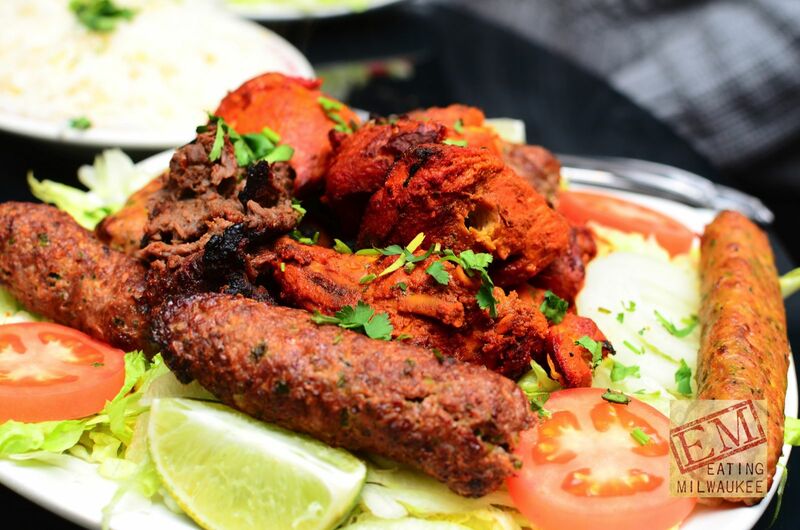 When we first started going to Tandoor, my thoughts immediately turned to Shah Jee, a (literal) hole-in-the-wall my mother and I used to frequent on my days off in high school. 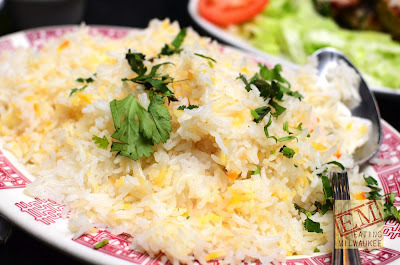 I thought, "Ahhh, I remember these flavors..." but what I failed to connect was that Shah Jee was indeed Pakistani food, and that Indian and Pakistani cuisine share so many flavors, despite being very distinct sets of cooking traditions. Fast forward to 2012, and we're all a bit older, a bit wiser, and a bit... er, gray-er -- and Andy and Lauren are raving to me about G. Mirch Masala -- "You've got to try it!" Lauren would beg, practically drooling over the thought of plate upon plate Indo-Pak goodness. So, we made a date, and I drove over that invisible continental divide between the North and South sides known as I-94, to check out what all the hype is about. The first think you'll notice about G. Mirch Masala is its location: in a building which formerly housed The King & I Thai. 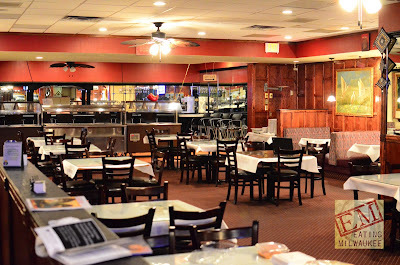 At the intersection of 76th Street and Good Hope, G. Mirch Masala lives in a very unique part of town. The Northern suburbs are living proof of what White Flight and urban sprawl can do to a city: houses abandoned and boarded up, businesses vacant, and empty lots, maybe once occupied by now burnt-down residences or maybe never built upon in the first place -- an area that population and economies simply couldn't support. Despite the slightly depressed neighborhood, G. Mirch Masala does a lively business, with a popular lunch buffet, and substantial night-time dinner crowds. 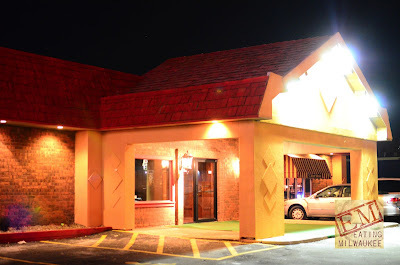 The night we went, we came late, and missed most diners, but Andy and Lauren assured me the restaurant is consistently busy. The exception, of course, is during Ramadan -- Andy said, "I think we were pretty much the only people in here that day." The lassi was incredibly thick, something that was abated as the ice melted. 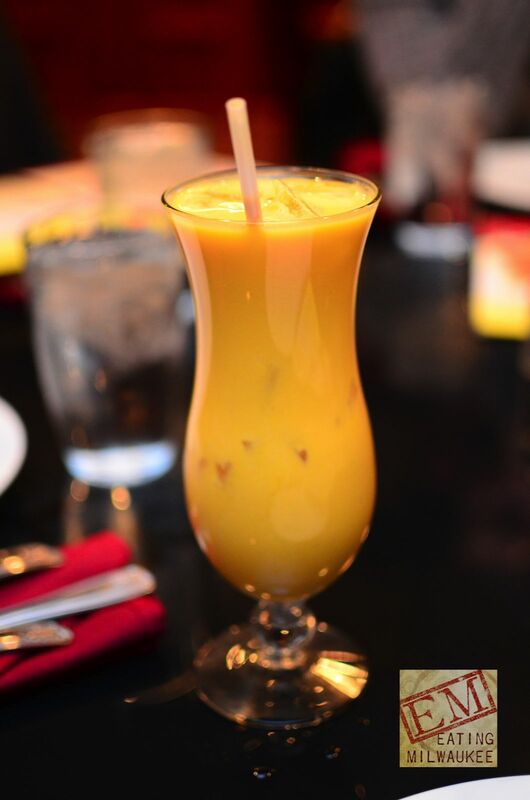 The thick, tangy yogurt blended with milk, sugar, and mango puree made the perfect palate cleanser to the tongue-tingling meal to follow. which were wrapped in the traditional, more crumbly pastry shell. 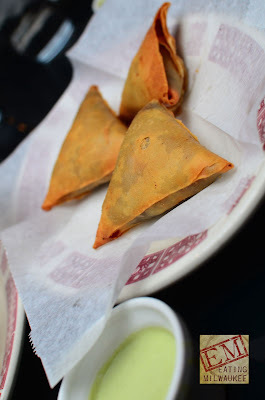 I can't say I've ever actually seen a beef Samosa before, mainly because we tend to frequent more Indian restaurants than Pakistani, and I'd have to say I'd be slightly turned off at an Indian restaurant offering beef anything. The veg Samosas were tasty and brightly spiced, with chunky potatoes packing the tender pastry. 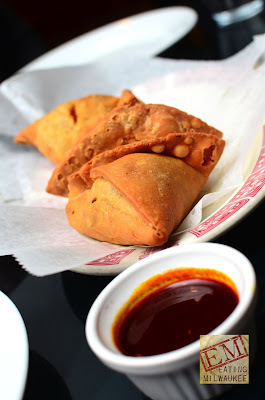 The beef Samosas were equally well spiced, but I'd have to say that the texture of ground beef freaks me out just a little bit -- it reminds me of tater tot casserole in the lunch room as a kid. The chicken Samosas were dead on -- perfect little bits of chicken with enough heat to make things interesting, but not enough to get me diving for my fabulous lassi. It should be noted, however, that the rice was not included with the dinners. If one wanted rice, it is available per-platter, for a small price. There is also an option to make your dinner a "combo," which is to say with rice and Naan, for a nominal charge. My question is... who would want a curry without rice? 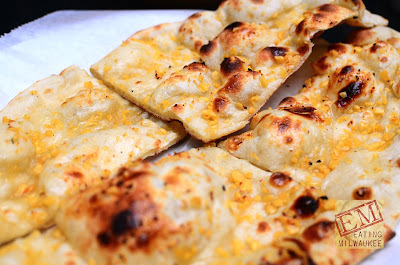 Or Naan? Perhaps someone unfamiliar with Indo-Pak? Or have we been eating curries wrong all along? Either way, we ordered enough rice and naan to go around the table twice over. One of the things I had to continually remind myself of is that G. Mirch Masala isn't Indian food. Well, I mean, it is. But, it's Indo-Pak. We've had this discussion already. Different cultures, different cuisines, different expectations. Don't expect Indian spicing, 'cause you're not going to get it out of anything but the Tandoori chicken (which, by the way, is the best I've ever had. Period. End of sentence.). 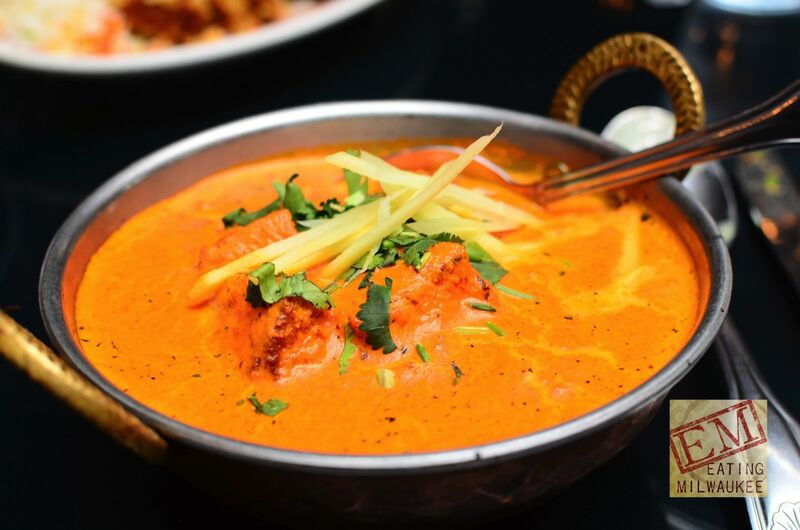 Lauren's Chicken Makhni was delicate and creamy, just the way you'd expect it to be. Gone, however, was the managerie of aggressive spices of its strictly Indian cousin, giving way to a sweeter, more subdued flavor of the gravy: tomato, cream, and butter, with notes of garlic and ginger. While I think I would have liked it with a bit more chili heat, it was a nice departure from the typical butter chicken recipe. 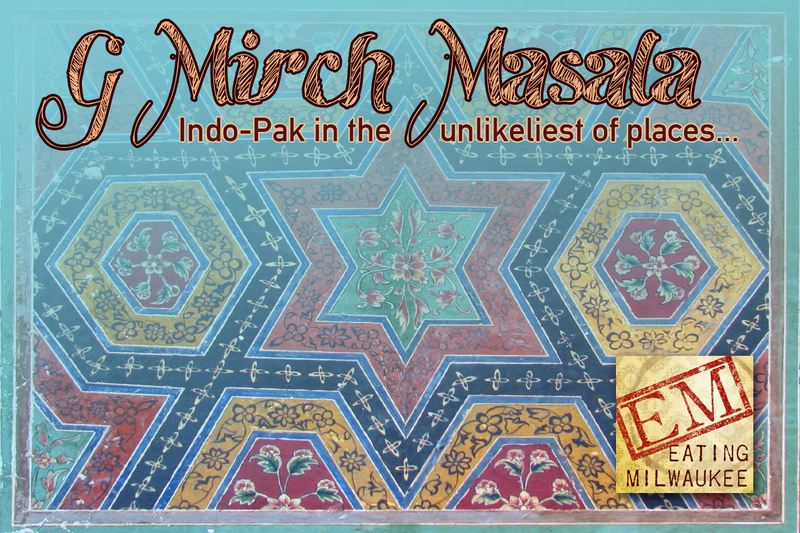 If Royal India's Butter Chicken is like a Sibelius chorale, G. Mirch Masala's is like a very talented singer-songwriter playing the guitar and harmonica. I like it. Andy's chicken was bright and brash, with big obnoxious frat-boy chilis in the front, and bold and acidic tomato and onion and garlic flanking the heat. The heat quickly gave way to a warm blend of spices, making this one a beautiful choice on a cold winter night. Jim's Meat Mountain was, well, meaty. The kabobs were executed extremely well, the Tandoori chicken was marvelous, tender and flavorful, and I was a big fan of the spice level of every item. 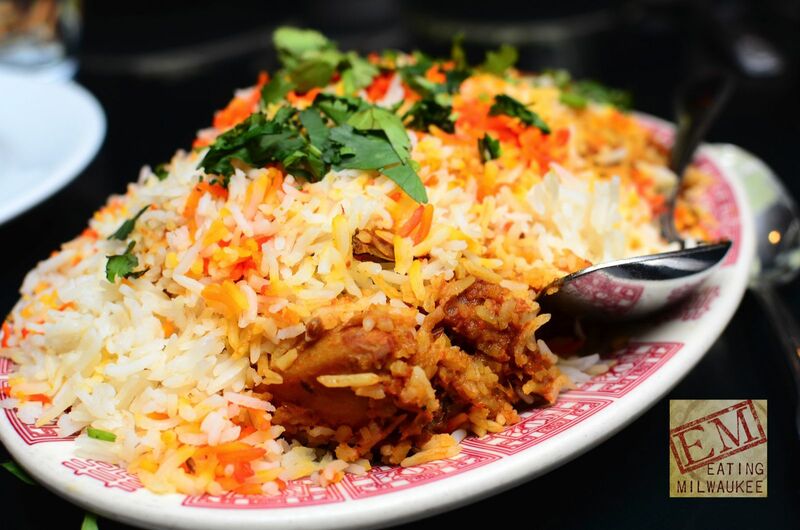 Adam's Chicken Biryani reminded me immediately of a chicken 'n' rice casserole my mom used to make when I was a kid: warm, hearty comfort food, with a little bit of chili heat, a little bit of aromatics, but nothing Earth shattering or groundbreaking: just delicious, hearty food. Marcia's chicken proved interesting: cooked well, spiced just right, and marinated in cream(? ), the only off flavor I could immediately identify was that of burnt milk in the spots where the grilled chicken charred a bit. Still, very tasty. 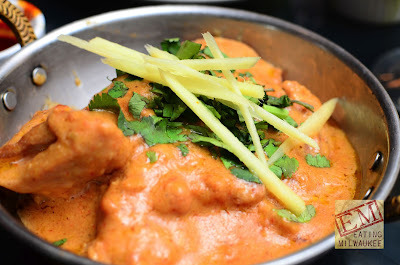 My chicken Qorma (or, how I'll probably slip and spell it at least once, Korma) was divine. Enragingly tender chunks of dark meat chicken lurking in a sweet and garlicky cashew cream gravy. Add in the fresh julienned ginger on top, and my palate was awash in richness and heaviness: this is not diet food. 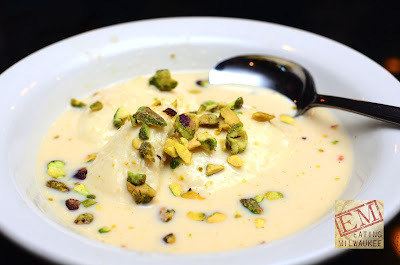 The Qorma represents one of the fine points of Indo-Pak cuisine that I love so much: balancing spices which, in less able hands, can chew scenery, with delicate and easily mashed flavors like cream, cashew, and butter. Think butter versus cinnamon: who would you be more likely to taste? This Qorma built flavor layers deftly, ranging from wafts of complex spices, to big beautiful foundations of sweetness and the fat of the cashews and cream. 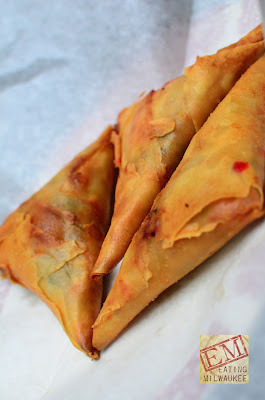 Neither too rich nor too lean, I would go back to Mirch for the Qorma alone. And probably a few orders of that garlic-studded naan. 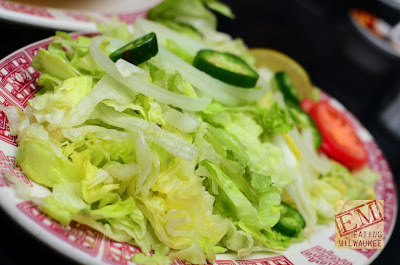 Served with dinner was a salad(?) which, strange as it may seem, was absolutely heaven with the cilantro and tamarind chutneys drizzled over it. Every thought to use cilantro chutney as salad dressing? Neither have I. Try it. You'll thank me. Rich with dairy, the kulfi was enough that our entire table had a sample, and just enough sweetness to cap off the mildly spicy meal. It's been a long time coming -- getting a new review up. Life has thrown the staff of Eating Milwaukee a few curve balls here and there, but the amazing part, the reassuring part, the part I love the most -- is that we, after all this time, still can come together and enjoy a great meal, in a new and interesting location, as the best of friends. G. Mirch Masala is a delicious departure from standard Indian fare (if Indian food can ever be called standard). Andy and Lauren have been bugging me for months to try it, and now I understand why: the usual suspects are all there on the menu, but they all have just a little different character, a little different twist. With the warm welcome we recieved, the excellent service, and the enthusiastic recommendations, there is little room for me to criticize G. Mirch Masala. It was a fantastic opportunity to share the evening with my Eating Milwaukee friends, and enjoy yet another facet of Milwaukee's ever-diversifying food scene. G. Mirch Masala resides in what used to be The King & I Thai restaurant. By its location in the city, and the remaining design cues in the building, it had obviously been a pretty hip joint in the 70's (for some reason, Boogie Nights comes to mind...). Not much has changed, meaning the interior is warm and careworn, but still very servicable and pleasant. 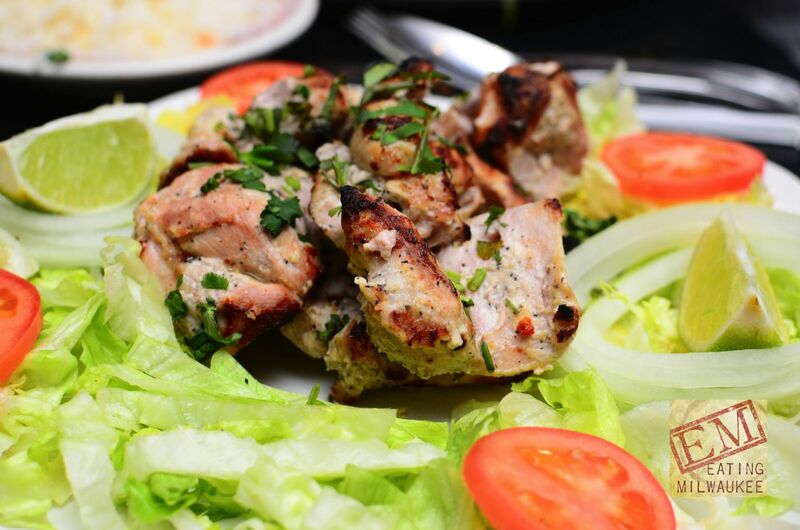 What appears to be downright cheap prices for most dishes turns out to be just slightly-less-expensive-than-normal when you add in rice and naan. Which, of course, you'll do. 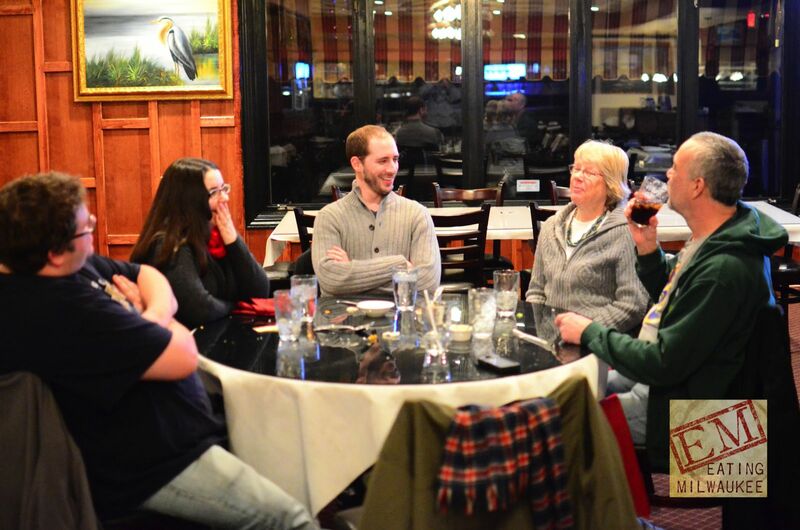 Our servers were extremely attentive, sometimes almost to a fault. I loved that one of the waitresses we had actually took part in making some of the food, and she was very quick to explain to us the painstaking processes! 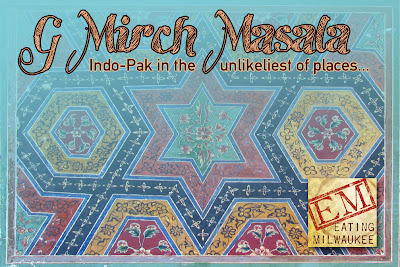 As an excercise in Indo-Pak, G. Mirch Masala excels. 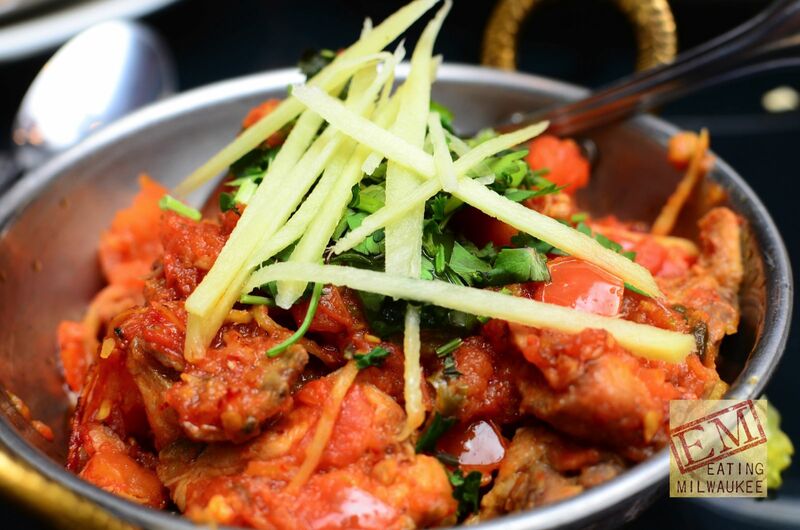 If diners go in with the expectation of having an "Indian" dinner, they may be a bit disappointed, as the specific dishes don't always correlate -- but come with an open mind, you'll find Indo-Pak a refreshing change from the everyday curry.